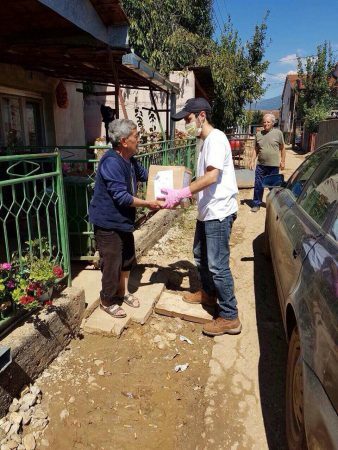 A week after the August 6-7 disastrous floods that struck Macedonia, the American Jewish Joint Distribution Committee (JDC) together with the Jewish Community of the Republic of Macedonia and the Holocaust Fund of the Jews from Macedonia, have assisted thousands of flood survivors by creating and distributing 1000 hygiene relief kits throughout the hardest-hit areas of the Balkan nation. The packages, created at a Jewish community volunteer event on August 14, will help address personal and household hygiene needs, a critical component in flood recovery zones, a JDC media statement said. In the wake of the sudden floods, JDC partnered with the Macedonian Jewish community to both assess needs and strategically target aid to the most vulnerable, the statement said. 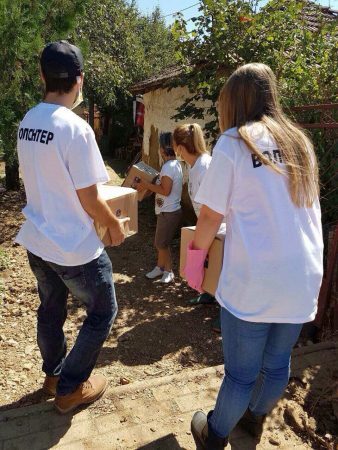 To address growing needs among flood survivors, 1000 hygiene relief kits – including medical soap, disinfection solutions, and cleaning supplies to sanitize homes filled with flood debris – were assembled by the Jewish community, including the local youth group, and distributed to aid about 5000 people in Stajkovci, Smiljkovci, Brnjarci, Indzikovo, and Chento. Macedonia is home to about 250 Jews, mostly of Sephardic heritage, with an extensive network of social welfare services, Jewish educational, and religious programming. This is the second time that JDC and the Macedonian Jewish community have provided humanitarian relief in response to a local crisis. In 1999, JDC and the Macedonian Jewish community created an organization called Dobre Volje, or Good Will, to provide nonsectarian humanitarian aid to Albanian, Serbian, and Gypsy refugees who fled to Macedonia during and after the Kosovo War. JDC, which has a longstanding partnership with the Macedonian Jewish community since the 1930s, focuses its work today on empowering and training Macedonian Jewish leaders and including them in pan-European Jewish cultural and educational activities. These activities include regional Jewish leadership seminars; Macedonian Jewish youth attending the JDC-Lauder International Jewish Summer Camp at Szarvas, Hungary; and a program for Macedonian Jewish teens to network with their Jewish peers globally and engage in service work through JDC’s partnership with BBYO, the pluralistic Jewish teen movement.